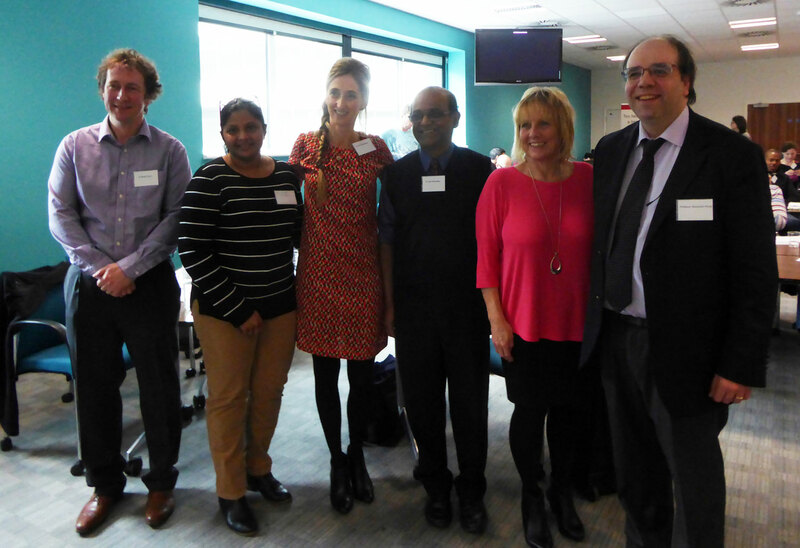 The first UK Fibromuscular Dysplasia (FMD) Information Day was held in Salford on 19 January, hosted by the Fibromuscular Dysplasia Society UK & Ireland. 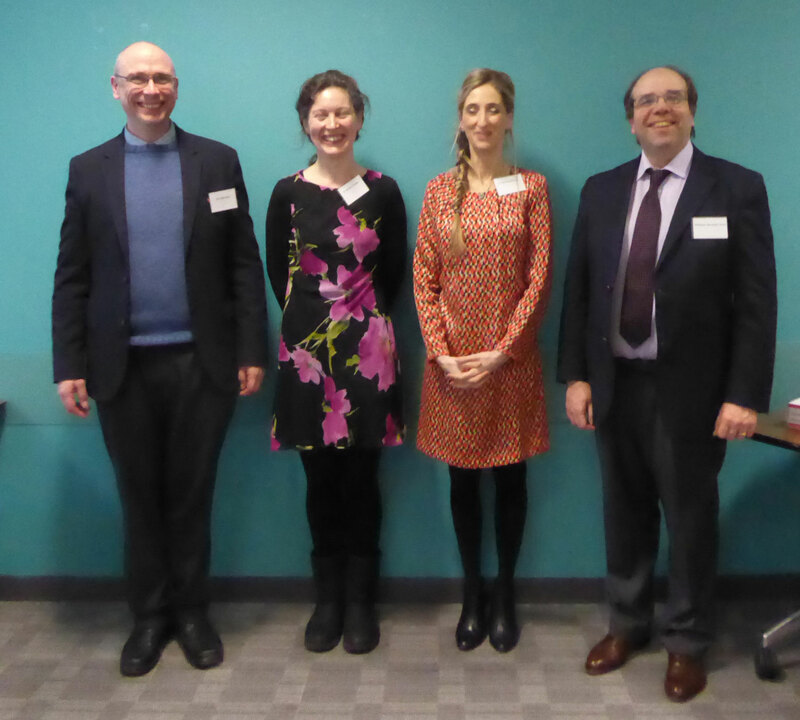 Many SCAD patients are also diagnosed with FMD so this was an excellent opportunity for the Beat SCAD Trustees to find out more about the condition. The day was a great example of how patients and SCAD and FMD experts in the medical profession are collaborating in the search for answers. 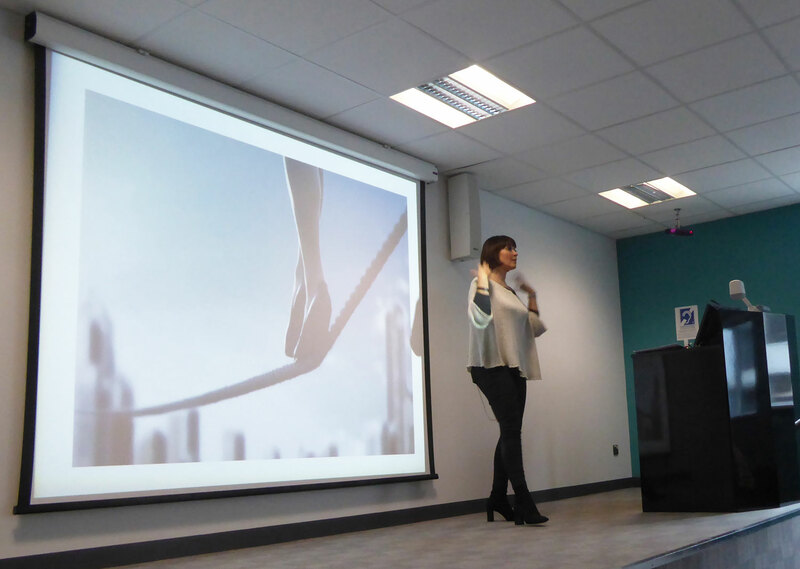 The day kicked off with Dr Tina Chrysochou, Consultant Nephrologist, Salford Royal Hospitals NHS Foundation Trust and Lead RADAR FMD Special Interest Group, explaining what FMD is. 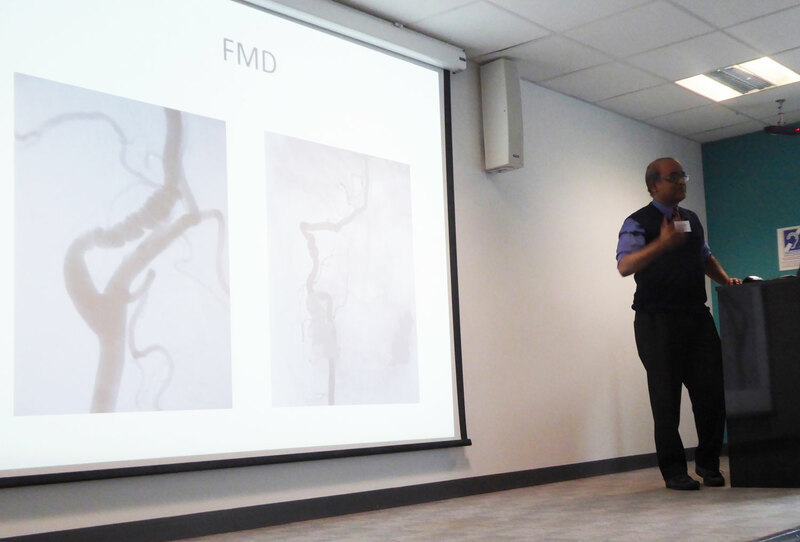 She explained that FMD causes narrowing and/or enlargement of one or more medium-sized arteries. This can reduce blood flow and affect the function of organs. FMD is more common in women (approx 80-90%) but does occur in men too. Current figures indicate that it mainly affects arteries leading to the kidneys, but is also found in arteries leading to the neck and brain, heart, abdomen, arms and legs. The cause is unknown, but it is not an inflammatory condition, nor is it caused by atherosclerosis (furring of the blood vessels). It is not known whether there is a hormonal factor. Some people who have FMD are asymptomatic but others may have complications such as high blood pressure or artery dissections. Dr Chrysochou discussed the association of FMD with SCAD, saying some figures show 50-75% of SCAD patients also have FMD, but the converse is rare, ie fewer FMD patients have SCAD. Figures from the European FMD Registry show that out of 687 patients, just 78 had SCAD. FMD was familial in just 2% of cases and two-thirds of patients have FMD in more than one vascular bed. As with SCAD, research is ongoing, and the first Consensus Statement, published recently, was a collaborative project that included FMD and SCAD experts. 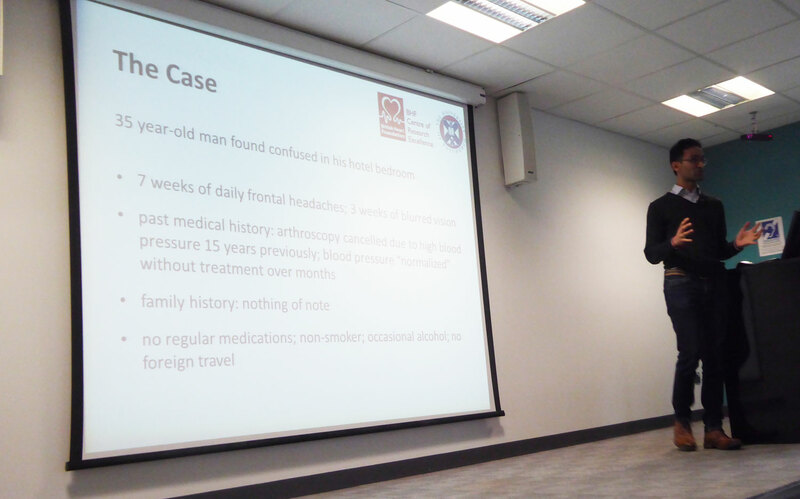 Following Dr Chrysochou’s very informative presentation, Dr Neeraj Dhaun, BHF Intermediate Clinical Research Fellow & Honorary Consultant Nephrologist, Queen’s Medical Research Institute, Edinburgh, described an unusual presentation of FMD involving a 35-year-old man who was found collapsed in his hotel bedroom. He’d had seven weeks of daily frontal headaches and three weeks of blurred vision. He had very high blood pressure but was a non-smoker and was on no regular medication. He had recurrent seizures, had gone blind and had amnesia. Although a challenging case, the patient was diagnosed with FMD and, once treated, his blood pressure returned to normal and his sight returned. 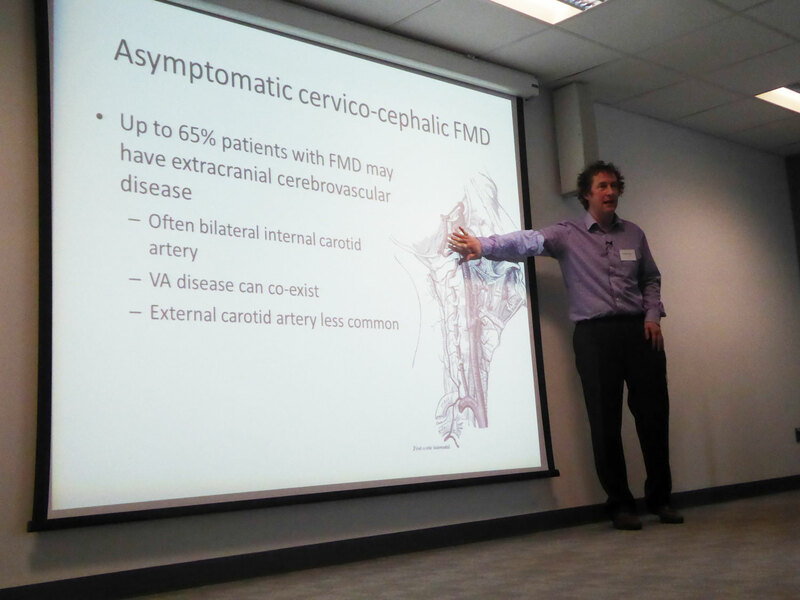 Dr Amit Herwadkar, Consultant Neuroradiologist, and Dr Martin Punter, Consultant Neurologist, Salford Royals Hospitals NHS Foundation Trust, explained cervico-cephalic (neck and head) FMD. Symptoms of cervico-cephalic FMD are headaches, pulsatile tinnitus and neck pain. 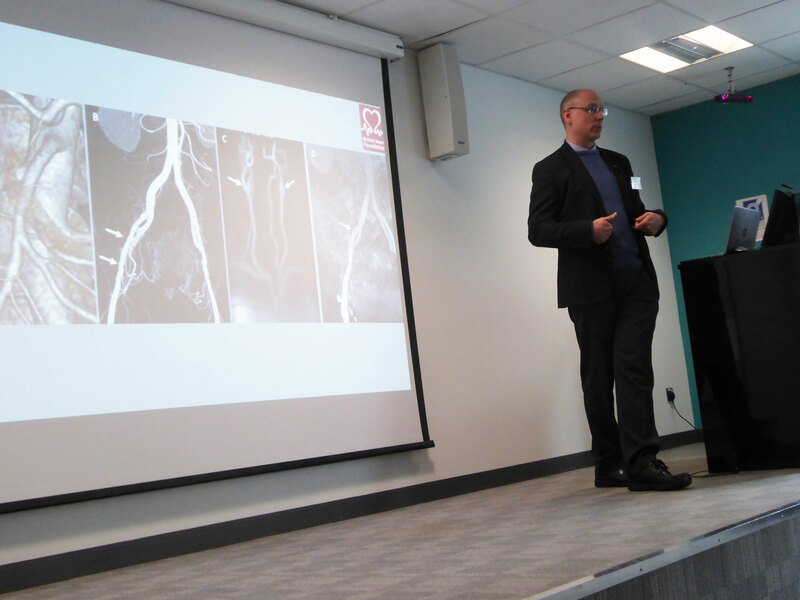 Dr Punter said up to 65% of FMD patients may have extracranial cerebrovascular disease (ie carotid or vertebral narrowing outside the skull), often affecting the bilateral internal carotid artery. Dr Herwadkar explained how imaging (CTA, MRA and Duplex ultrasound) is used to diagnose FMD and ascertain the extent of the disease in the head and neck. He explained that CTA is the first choice imaging or contrast-enhanced MRA is an alternative. Ultrasound would rarely be used as a first diagnostic tool. 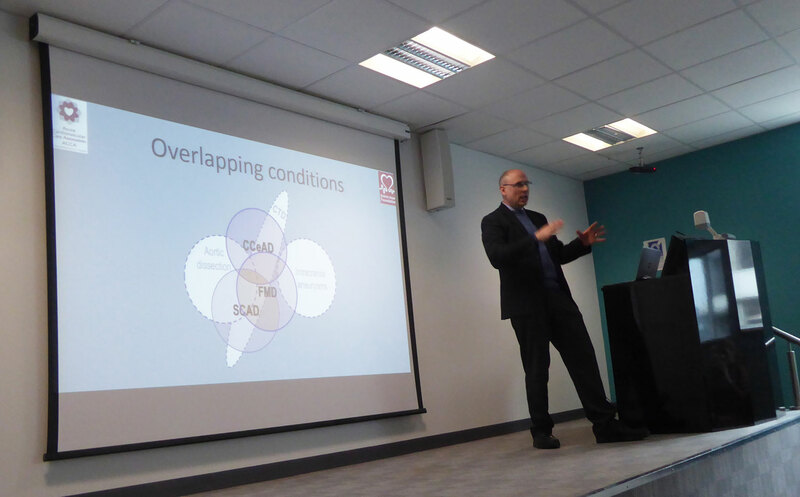 Dr David Adlam, Chair ESC-ACCA SCAD Study Group, Associate Professor of Acute and Interventional Cardiology, University of Leicester, who is leading the SCAD research project in the UK, presented on the link between FMD and SCAD. FMD is one of the conditions found in some SCAD patients, along with cervico-cerebral artery dissection (CCeAD), aortic dissection, intracranial aneurysms and connective tissue diseases. The recent finding that a common genetic variant on the PHACTR1 gene is associated with increased risk of FMD, CCeAD, SCAD and migraine is a big step forward in the quest to understand these conditions. 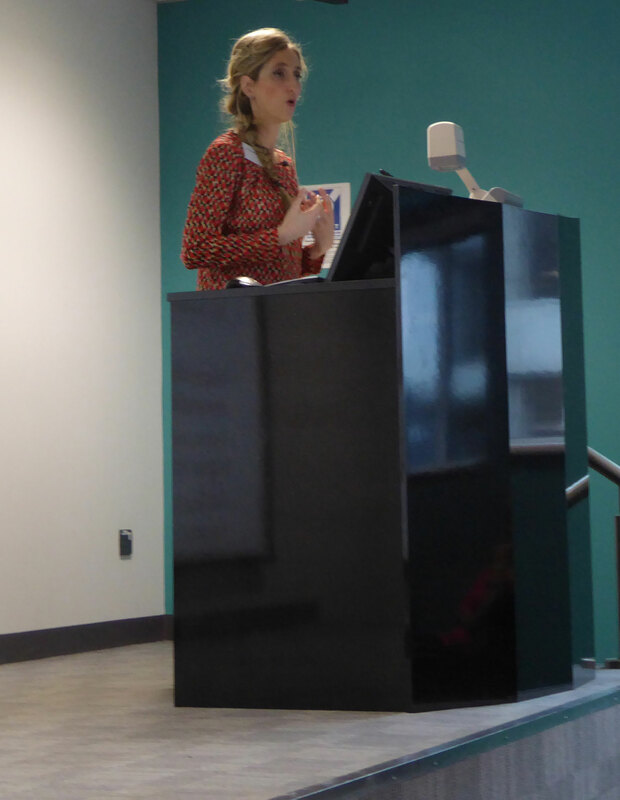 Sally Bee, celebrity chef and wellness coach and FMD and SCAD survivor, gave an uplifting talk to patients, saying it is up to individuals how they react to their diagnosis and that a positive attitude goes a long way. She described how her SCAD in 2004 was a devastating blow to her and her family, including three children under five, but despite the odds she recovered. She was also diagnosed with FMD and had a second SCAD in 2016. A positive attitude and healthy eating has been a cornerstone of her recovery and her daily life. 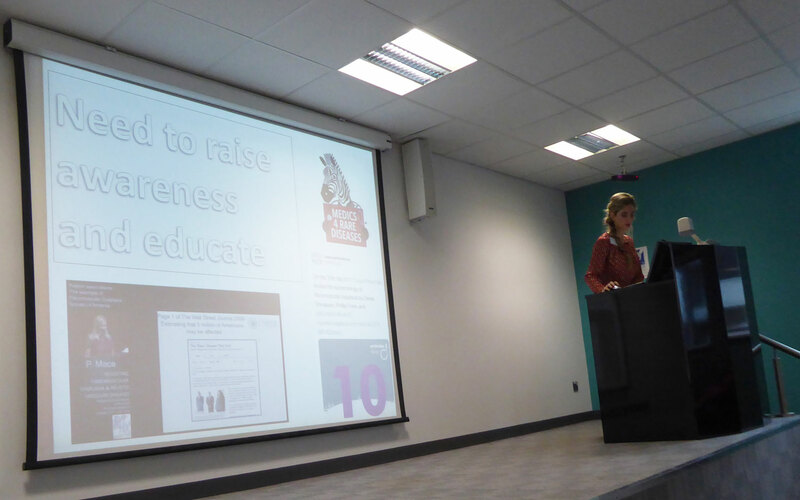 Karen Rockell, Founder of the FMD Society of UK & Ireland and Beat SCAD Trustee, told delegates that the society aims to support FMD patients and families and encouraged people to get involved and offer their help. The delegates finished the day with a workshop to identify what they would like from an FMD clinic and research. Feedback from the day was very positive and the Beat SCAD Trustees certainly learnt more about FMD and its potential links with SCAD. 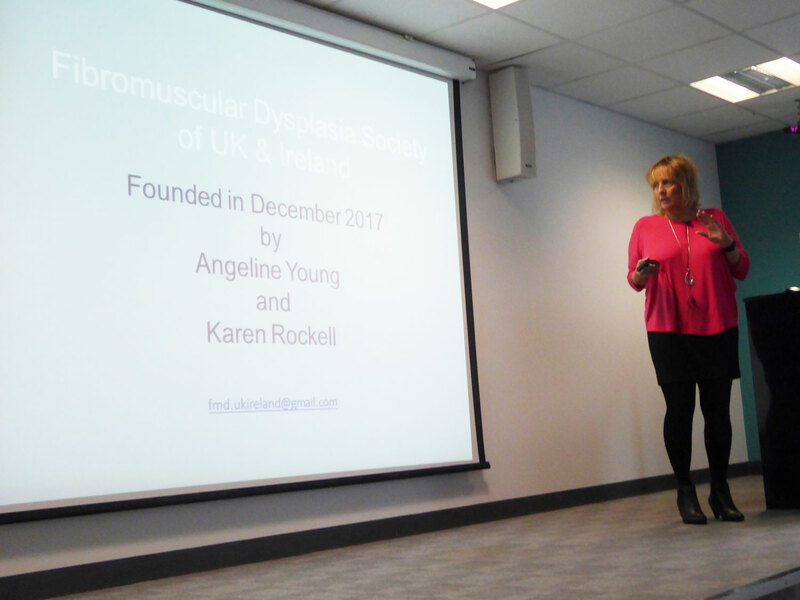 The presentations have all been filmed, so keep an eye on our Facebook page and that of the FMD Society of UK & Ireland for further information.